How did you spend opening day of baseball? 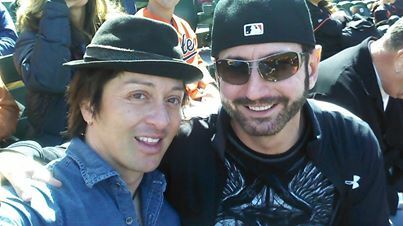 I spent it with my good friend… my Paisan, Johnny Alonso at Camden Yards, I’m an Oriole’s fan. (See pic.) Anyway…while I was there, I saw lots of people, all donned in their BEST black and orange colors! Tell me what you wore to the game? Who is your favorite team? Send me us some pics here! We love to share here at The Ledge Comb! And don’t forget, just because you are wearing your favorite team’s colors, doesn’t, (and I mean the baseball cap, doesn’t mean that your hair doesn’t matter) Rock the cap! The Ledge Comb can help!